CHICAGO (WLS) -- Six people were injured in a rollover crash on northbound Lake Shore Drive near Ontario Street in Chicago's Streeterville neighborhood. Police said a speeding van crashed into a wall and flipped over in the 600-block of North Lake Shore Drive around 3:30 a.m. Friday. Six people were taken to Northwestern Memorial Hospital, Advocate Illinois Masonic Medical Center and Presence St. Joseph Hospital, the Chicago Fire Department said. Three people were listed in serious-to-critical condition and three other were listed in fair-to-serious condition. No further information about the victims was released. 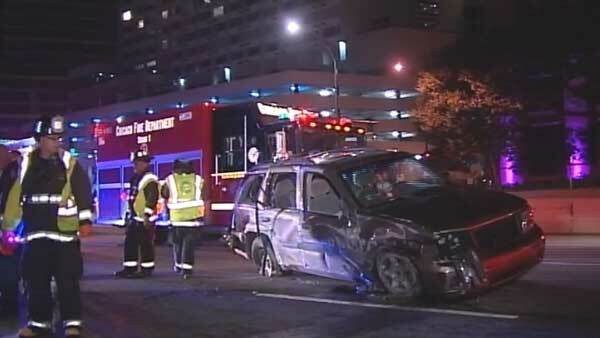 Six people were injured in a rollover crash on northbound Lake Shore Drive on Chicago's North Side.